When Was the Department of Justice Established? Jennifer Freilach is an HNN intern and graduate of California Polytechnic State University, San Luis Obispo (2016). The Judiciary Act of 1789 established the US federal justice system. Most notably, it created the Supreme Court and the post for the Attorney General (which began as a part-time job). As time went on, the responsibilities of these positions increased to adapt to a growing nation. The Supreme Court grew in membership from six to nine, and the Attorney General became the head of the Department of Justice. 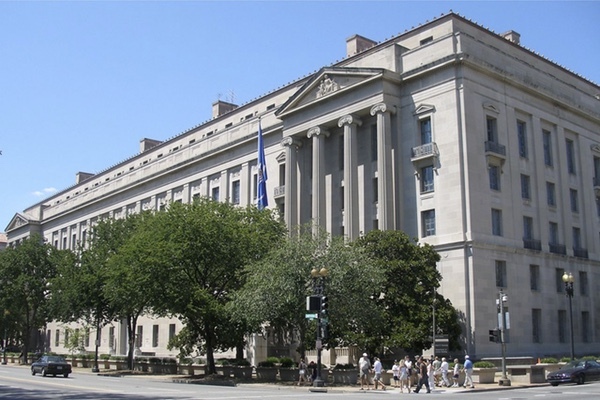 The Department of Justice (DOJ) was created by the Act to Establish the Department of Justice in 1870. You would think we’d know why it was established. But we don’t. That is, we don’t know definitively. There are plenty of theories, though. One widely accepted theory, reiterated by Fordham Law Professor Robert Kaczorowski, is that the DOJ was created to help deal with the general influx of litigation that occurred at the end of the Civil War. Another theory — backed by scholar and Stanford Law Professor Norman Spaulding in 2010 — is that the federal government created the DOJ during Reconstruction to help enforce former slaves’ civil rights. This narrative fits well with the DOJ’s goals in the 1960s under the leadership of Robert F. Kennedy, who fought to protect African American’s civil rights. But is this theory incomplete — or flat out wrong? In 2014 Jed Handelsman Shugerman, scholar and Fordham Law Professor, provided an alternative interpretation of the DOJ’s purpose in post-Civil War America. Rather than emphasize the DOJ’s role in civil rights, Shugerman points to its role in the “professionalization of American legal practice.” At the time, it was thought that well-trained lawyers who practiced with non-partisan views were less likely to be corrupted. This same principle led congressman Thomas Jenckes and his associates to create the New York City Bar Association in 1870 — the first of its kind — to ensure the faithful practice of the law. Today, the modern bar association continues to grow as the demand for lawyers is on the rise. It may seem obvious now that lawyers should be trained and required to meet a high standard; however, that was not always the case. In the antebellum period lawyers (like Lincoln) apprenticed themselves to established attorneys. As the DOJ was forming, so was the idea of “bureaucratic autonomy and expertise.” Theoretically, having an independent or non-partisan Attorney General at the head of the DOJ made it more difficult for executive officers to circumvent the law and get away with it. This was a big change from the spoils system that prevailed prior to the Civil War. Today the Department of Justice is a colossus. The 2017 fiscal year budget request is $29.0 billion, which includes 118,110 positions, including a Deputy Attorney General (post established in 1950) and an Associate Attorney General (1977).